Less than two weeks after Trump signed his executive order supposedly halting the separation of families arrested at the border, three things are apparent. First, the Trump/Pence regime’s depraved and deliberate cruelty is not only continuing, but in some ways escalating. Second, this is not only generating massive revulsion and outrage, it has begun to reveal this regime’s fascist intent and program to millions who could not, or would not, see it before, and to objectively raise huge questions about the system that gave rise to this border and to a situation in which people risk everything to cross it. Third, on that basis real questions of how to act—and indeed, of what it means to be human—are being posed to millions. We—the masses of people—must act to stop this whole fascist program and demand that this illegitimate, immoral regime be removed from power. Everyone reading this should build for July 7. There’s no end to the Trump/Pence regime’s depraved cruelty on the border and to immigrants overall—and to the ongoing exposures of them by victims, lawyers, activists, and journalists that has been an important component of this ongoing and very volatile crisis. 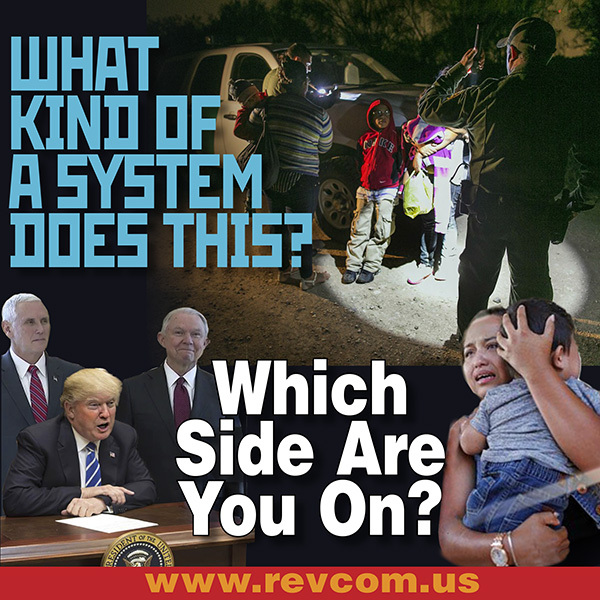 What has come to light about this cruelty at the border is but one part of a whole sinister campaign directed and promoted by Trump, Attorney General Jeff Sessions, and the whole fascist regime to paint these immigrants—and all the people like them who are already in the U.S. or may come—as subhuman animals, criminals who have no rights and should be ethnically cleansed from this country. This is part of a whole fascist consolidation being cemented in place in the U.S. right now. First, Trump’s order did not call for reuniting parents and children who had already been ripped apart at the border. Second, his “zero-tolerance” policy of arresting and criminally charging everyone who crosses the U.S.-Mexico border without permission is still in force. Border authorities have temporarily halted these mass arrests because they have no place to put the people they have detained, but the underlying policy remains in place. Some 2,047 children who were separated from their parents since May still remain in federal custody. On June 26, a judge ruled that children separated from their parents must be reunited with them—within 14 days for children under five and 30 days for older children. Yet 10 days after Trump’s order, the New York Times reported that only six—repeat six—of those 2,047 children—have been reunited with their parents. The reality is that court order or no court order, parents and children caught in the maw of U.S. immigration face a nightmare of vicious, Nazi-like treatment. Some parents have already been deported, while their children remain in the U.S., making it extremely difficult, if not impossible, for them to ever be reunited. Detained immigrants are given an 800 number to call, only to be told, “Yes, we know that the child is in detention. We can confirm that. But we cannot give you the information as to the exact location of that child,” according to an attorney interviewed on Democracy Now! The regime claims it will try to reunite families, but then demands they fill out lengthy forms, submit to background checks, and have everyone in their household fingerprinted. So in the name of family reunification, this fascist regime is creating an anti-immigrant database that could be used for mass roundups, mass arrests, and mass deportations. Instances have been reported of toddlers as young as three being taken to deportation hearings by themselves—without legal representation—and just given a list of service agencies to choose from. In South Texas, there have been mass prosecutions in federal court of up to 70 detained migrants in the morning alone, with similar numbers in the afternoon, many with no legal representation. In addition to more than 2,000 children stolen from their parents, the U.S. is holding another 9,000 undocumented children who arrived unaccompanied. As if all this wasn’t horrendous enough, Trump is now threatening more overtly fascist measures—depravity prefiguring genocide. This includes erecting one obstacle after another to migrants’ exercise of their legal rights, or even dispensing with due process altogether: “When somebody comes in, we must immediately, with no judges or court cases, bring them back from where they came,” he tweeted. Now, his regime has gone to court to demand the right to hold migrants and their children indefinitely, abolishing the Flores settlement agreement, which mandates that the Department of Homeland Security release immigrant children from custody after 20 days. And when people move to shut down this machinery of torture and deportation, the regime sends in Homeland Security pigs to assault the resistance, as it did against “Occupy ICE” protests in Portland, Oregon; Detroit; and New York City. Not a day has gone by since this crisis broke, two weeks ago, when some form of protest or resistance hasn’t taken place somewhere across the country. There have been protests large and small in cities and towns all across the country, including 750 different protests on June 30 alone, all told involving hundreds of thousands of people. Significantly, this wave of protests has gained steam after Trump announced his executive order, and the Supreme Court’s upholding of his Muslim travel ban also sparked protests across the country. People have been so outraged, they have hounded representatives of the regime when they appear in public—Press Secretary Sarah Huckabee Sanders and Homeland Security Secretary Kirstjen Nielsen when they were trying to enjoy a nice, quiet meal after locking children in cages; Transportation Secretary Elaine Chao and Senator Mitch McConnell outside their home; and Mike Pence and Jeff Sessions whenever they venture out to speak. Hounding these fascists is righteous and very important in delegitimizing them and giving heart to the masses of people, while demands for civility are nothing but calls for normalization and accommodation. People from many walks of life have spoken out, including many prominent celebrities. Over 100 Microsoft employees posted an open letter demanding the company “put children and families above profits,” and end its work with ICE. “As the people who build the technologies that Microsoft profits from, we refuse to be complicit.” At other Silicon Valley tech firms, employees have been circulating emails and supporting protests against Trump’s assaults on immigrant families. There was an important protest of clergy in Los Angeles. Film director and activist Michael Moore recently warned “Fascism is at the doorstep,” and called for one million people to surround the U.S. Capitol and prevent Trump and the Republicans from choosing a new Supreme Court Justice. The uproar has also sparked divisions within the system’s institutions. Some 19 ICE agents have demanded their agency be disbanded. Seventeen states have filed lawsuits against Trump’s immigration policies. A growing number of cities and counties are ending their contracts with ICE to detain the undocumented. Some airlines have declared they will not transport children who are being separated from their parents. Demonstrate Saturday, July 7—This Nightmare Must End: The Trump/Pence Regime Must Go! The tremendous outpourings that have swept across this country in the face of the images of children in cages and the audio of children crying for missing parents shows the great potential that exists in this country to move millions to rise up and STOP a fascist America in the only way it can be done: by driving out the Trump/Pence regime. But it is urgent that people who want this fight for the only demand that measures up to the threat posed by this historical moment: This Nightmare Must End: The Trump/Pence Regime Must Go! That is what Saturday, July 7, is about, taking the next essential step, bringing forward people across the country to demand the ouster of the whole regime, and moving us closer to the moment when we can make that demand real in the way laid out in the Refuse Fascism Call to Action. As part of building for July 7 and beyond, Bob Avakian’s filmed talk “THE TRUMP/PENCE REGIME MUST GO! In The Name of Humanity, We REFUSE To Accept a Fascist America: A Better World IS Possible,” will make a major difference in how people see the political situation and the world. Beyond that, there are profound questions being raised as to what kind of system carries out this cruel persecution and demonization of immigrants and refugees, and what must be done to end it. 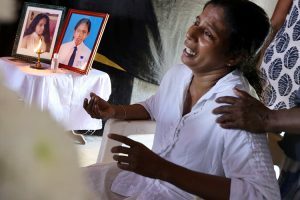 This system has sucked the blood of the global south, plundering the environment, ripping apart societies, and driving hundreds of millions off the land and into desperate circumstances. Then, when people desperately come into the imperialist countries to survive, they are both super-exploited in the very worst jobs and often robbed of their wages, and simultaneously demonized, denied rights, and today turned into scapegoats. Revolutionaries and communists should boldly bring out the fact that only a revolution to overthrow and get rid of that system—an actual revolution—can end this, and enlist people in that revolution right now. Obama: Aspergers, amoral, incapable of intellectual empathy, good actor; flat affect; a puppet for all the corrupt capitalists powers that paid for his campaign, caged kids, deported more than any other prez, loved killing all kinds of people with drones weekly; waged 7 wars simultaneously and lied about the lack of troops on the ground in Africa; tried so hard to please Zionists and other Fascists like the Saudi’s …so that was so much better????! Forget the soap opera and the gossip: get back to the basics of class exploitation, world dominance and destruction: the things all American Presidents have been the best at, bar none!